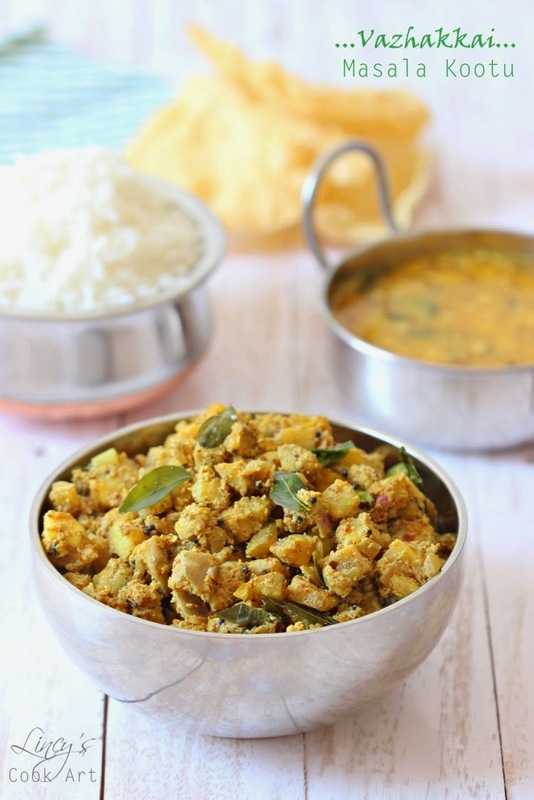 Vazhakkai Masala Kootu is an easy to make flavourful dry item served with rice. Plantain/ Raw banana is so versatile item which could be used to make many dishes like potatoes because of its texture. Used by vegetarians a lot as it is a best alternative for meat in many preparations like kofta curry etc. This cooks fast and become tender so it saves time in cooking. Kids too like it because of its soft texture. Best vegetable for those who are health conscious. About the taste of this kootu it is rich in garam masala flavour. I have learnt this recipe from a tv show and i make this now and then. I love this preparation with hot plain rice. It goes well with rice, rasam, dhal curry, curd..etc. In a blender jar add the coconut, dry red chillies, garlic cloves, peppercorns, fennel seeds,cinnamon, cloves and cardamom. Pulse twice and then sprinkle some water if required and grind as a coarse paste; set aside. Peel and cut the banana into small pieces and immerse them in water to prevent browning. Heat oil in a pan and the mustard seeds once it splutters add the curry leaves. Add the chopped onion and cook for a minute till the onion colour changes to pale. Now drain the cut banana from water and add with this tempering. Sprinkle some salt, turmeric powder and enough water to cook the banana. Cook the banana till soft but it has to to hold its shape. Now add the ground masala and mix well; cook till the raw flavour leaves and the nice aroma arises. Sprinkle extra curry leaves and check for salt and add if needed. Serve with rice, rasam or parippu curry combination.